Lt. Steven Combs is one of three sailors lost when their C-2A Greyhound crashed while conducting a routine transport flight on Nov. 22, 2017. Lt. Steven Combs, a Navy pilot, is being remembered for his bravery and pride in his job. Combs, who grew up in Dalton, Massachusetts, died last week with two other sailors when his plane crashed in the Philippine Sea. He attended the now-closed St. Joseph Central High School in Pittsfield, along with Lauren Horth. Horth, who now lives in Bolton, Connecticut, said they would still chat on FaceTime, as recently as a week ago. When she was home in Pittsfield for Thanksgiving, she learned vague information about the crash and said she texted Combs to see if he was OK.
"When I had heard what kind of plane it was, I had a bad feeling," Horth said. "And my text just never went through." The Navy said the Combs's C-2A Greyhound crashed last Wednesday while on a transport mission to the USS Ronald Reagan. Combs's sister told the Berkshire Eagle that he landed the plane in the Philippine Sea, making it possible for eight of the 11 passengers and crew to survive. Another classmate at St. Joe's, Jack Deming, said he became very close to Combs during high school, but hadn't talked to him a few years. Still, when he heard of his friend's death, the memories "bubbled up." "Just simple moments, conversations and -- of course -- jokes and laughs," Deming said. "That's something he was well known for -- his very loud, boisterous laugh and huge smile." Deming said he remembers Combs telling him in high school he wanted to be a Navy pilot. "That was his goal. He worked extremely hard academically -- well, he worked extremely hard in everything that he did," Deming said. "And that showed through his participation in athletics [particularly skiing]." Horth recalls a similar determination. She said Combs was "obsessed" with serving in the Navy. "He was probably the first person...in our group of friends that knew what he wanted to do with his life, from a very young age," he said. "I just want the world to know that he was the hero that we always knew he would be." Combs was 28 years old. 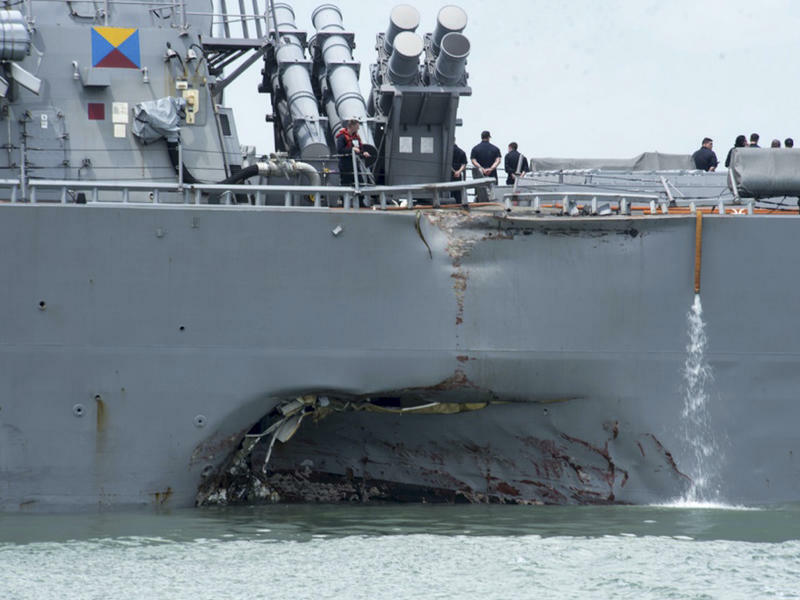 In the wake of deadly collisions between U.S. warships and commercial vessels, the Navy is issuing new orders that instruct its commanders operating in congested waterways to switch on an identifying beacon to help avoid crashes.